Ahh, Paris. I'll say right off the bat, the Eiffel tower is cool. And other then that, I didn't like Paris. Gasp! It feels so weird saying that.... how can someone not like Paris?! It's Paris! The city of lights, love, and crepes! But while their crepes were delicious, their macarons even moreso, it was just a big city, full of people, super touristy, and old tall buildings without any charm. Even the Eiffel tower, which I admit was stunning - especially lit up at night - is really just a big piece of metal. I do recognize that Paris was the last stop, and by this time, I was exhausted, dehydrated, and severely missing home-made food. However, even with that in mind, I can strongly say that I will be okay never going back to France. I still had some pretty cool moments though, one of them being: seeing the Eiffel tower for the first time (I think that's a given), and I really loved walking across the Love Lock Bridge. My friends are all cynics and were talking about how at least 70% of all those couples have probably broken up, gotten divorced, etc, and after I punched each of them in the shoulder, I sadly had to give them some credit, because they're probably right. It's such a touristy thing now anyways. Most of the bridge is panelled up now as well to prevent any more locks being put on, since all the added weight has caused damage to the bridge. But it was still pretty cool, and provided some really awesome pictures. 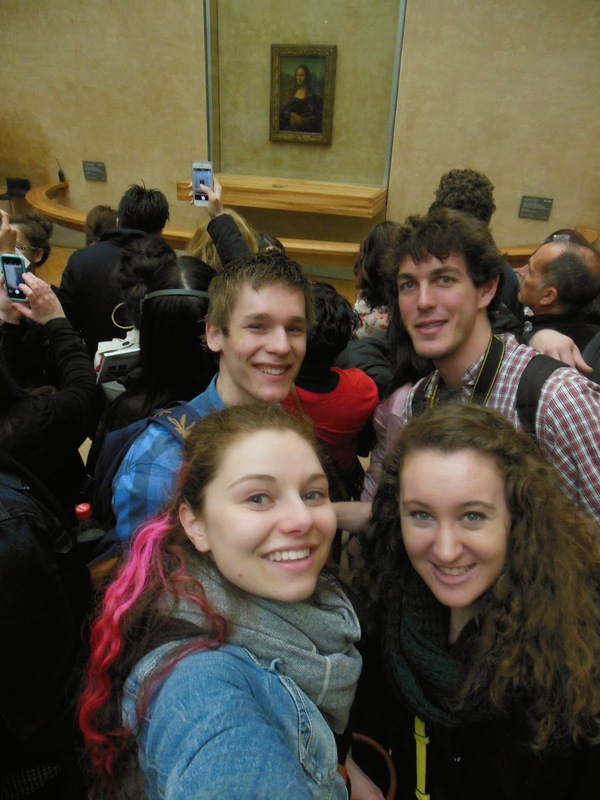 Other big things we did included going to the Louvre, walking through both the Sacre-Coeur, and Notre Dame, the Arc de Triomphe, Moulin Rouge, Champs-Elysées, a couple museums, and Mont Parnasse. Pretty cool stuff. It was interesting walking through the Louvre, seeing an astounding amount of beautiful art work, and then coming across the Mona Lisa. You can see it's encased in glass, is bordered off so you can't get close to it, and it even had a guard to the side - and obviously no other painting was safeguarded to that extent. Compared to many of the other paintings, I thought it was small and ... well, uninteresting. It's just a painting of a woman. If it wasn't famous, it would just be another painting to glance at and walk past. Yet here we all are, lining up and taking selfies. How easily we are all fascinated with things just because society convinces us they're important. The view of Paris from Mont Parnasse. We didn't climb to the top of the Eiffel tower since all the tickets were sold out, but we did this instead, which I think is just as cool. We went up 56 (or something like that) stories, and got to see the entire city. We timed it perfectly, and got to see Paris slowly transition from day to night. It was very, very cool. The Eiffel tower! Our second, and our last, full day in Paris we literally just spent the whole second half of the day looking at and taking pictures hahaha. It was awesome. Ah, the love lock bridge. How picturesque. After Paris, I met my parents and brother back in Ireland for the next three days! We met in Waterford, where I showed them my apartment, my school, and my Dad showed me his left side of the road driving skills haha. Since he kept us all alive, I deem it a success! It's a different view from the front of a car, and I was reminded again how narrow the roads are here. Everyone also drives like they're on a mission. Needless to say, I'm okay with not driving here myself hahaha. We were only in Waterford for half a day, since there's not much to do here. I think the main reason they came was cause it's where I'm living, so thanks guys! After that we headed to Dublin. To be honest, those three days were kind of a blur for me, filled with catching up on sleep, revelling in the chance to not make any decisions, and being incredibly thankful that I was staying in a hotel instead of a hostel. 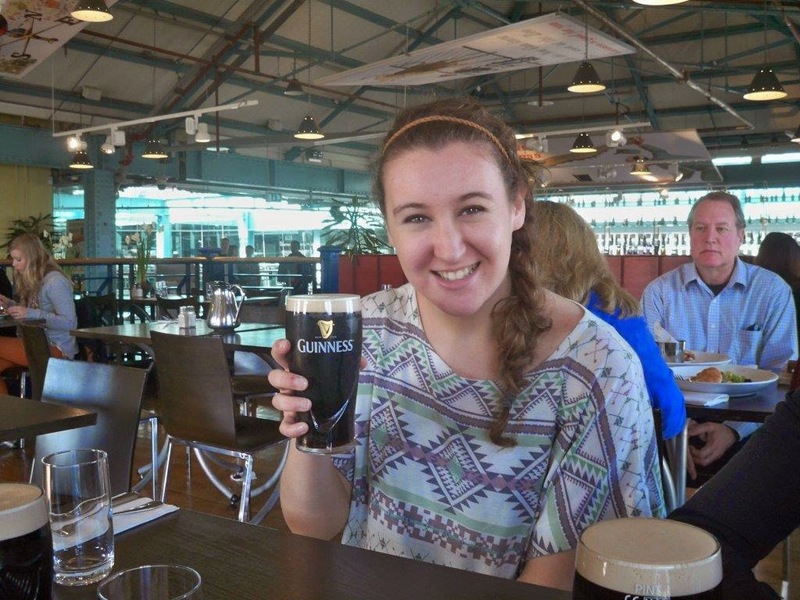 Nevertheless, from what I remember haha, in Dublin we obviously went to the Guinness Storehouse. We got to see in detail each of the ingredients, how they make it, and how their advertising escalated, among other things. It was neat! Even though I don't really like Guinness, it's such a big part of what Ireland is known for that it was a really cool thing to experience. 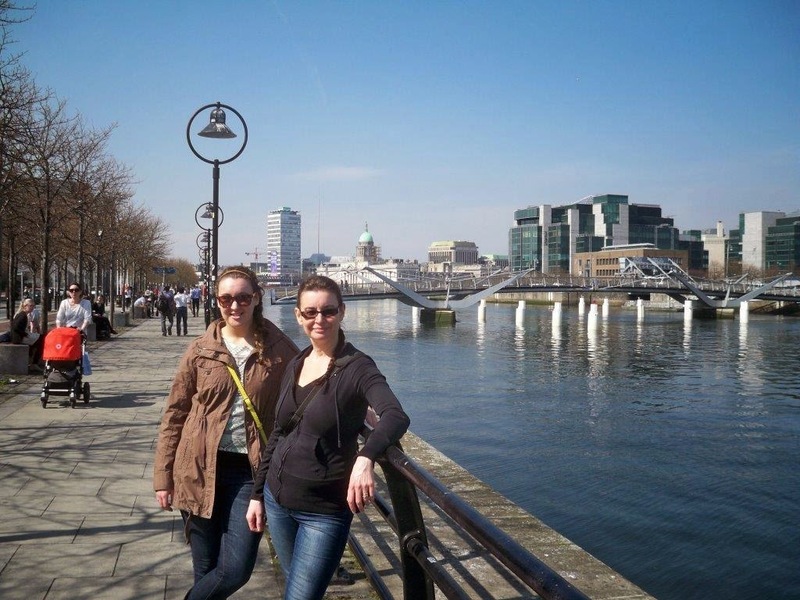 We didn't really do much else in Dublin - for being the capital, there's not as much to do as you'd think. We walked around, saw the Dublin Castle (which is undeserving of the title "Castle," if I do say so myself), and I pointed out stuff I'd gone to or seen on St. Patricks Day, which was cool. Dublin overall was extremely crowded and busy, like claustrophobically so. It makes me very glad that I'm residing in a smaller, much less touristy part of Ireland. 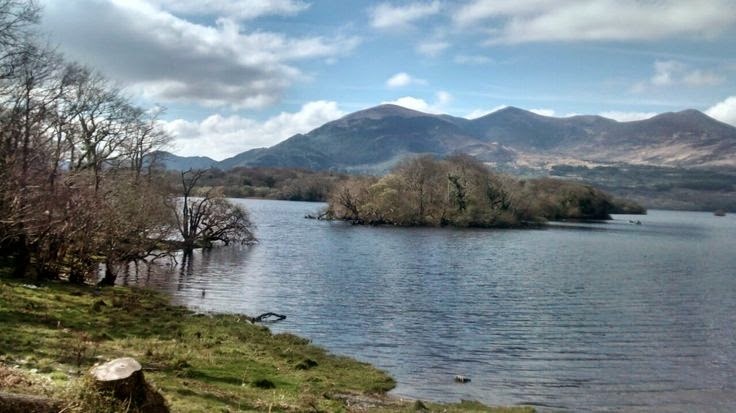 We also went on a trip to Wicklow and Kilkenny! I hadn't yet been to the Wicklow Mountains, and it was great. It's been somewhere that I have wanted to go from the start, and though I would've loved to spend more then just an hour or so there, I'm just glad I got to see it. Trees, lakes, and mountains - it was stunning. Probably the closest thing to Canadian landscape that I've seen too, since I otherwise have not seen any mountains. From there, we continued on to Kilkenny, where I have been before, but obviously the rest of my family hadn't, so that was cool. Kilkenny is such a quaint, small city, so I think my parents really enjoyed it. It was a good end to the day. And that was it! I said goodbye to Samuel and my parents at the airport the next morning, and then headed back to Waterford. It's crazy to think I'll be back at the airport to leave myself in just five weeks. Five weeks! I'm starting to think about coming home more often now, and I have mixed feelings, like I figured would happen. But before then, I still have three more days of school, and exams to get through - blech. Mom and I on the streets of Dublin. It was ridiculously warm that day actually. I'm not sure how that happened. I think I've forgotten what heat felt like, but it was amazing haha. We each got a complimentary pint of Guinness at the Storehouse. And I totally drank all of mine, what are you talking about?...... (if my sarcasm wasn't thick enough there, I definitely did not drink the whole thing. In fact, I only got through like 1/5th of it. If that. Twas a sad, sad day). The Wicklow Mountains. Pictures don't even do it justice; it was amazing. - I think those two weeks, I literally took every type of transportation imaginable. We went on planes, trains, buses, trams, a boat, the metro, the underground, and we also used our feet a lot haha. I think the only thing we didn't do was bike. Biking was actually something I really wanted to do in Amsterdam, but it didn't work out. So instead, we just looked at bikes, because they were everywhere. Like piled on top of each other, spilling into the street, you're about to get run over by a massive herd of bikes, everywhere. - Speaking of walking everywhere though, one of the guys has an app that told us how many km's we walked per day. I don't know what we averaged, but in Paris, in one day, we walked close to 20km! We were only a couple km's short of a half marathon distance! We didn't believe it at first hahaha. - So, now that I've gone backpacking for close to two weeks, here are my views on it, if I'm not to arrogant to think that you'll want to read my views haha. I think that traveling this way, with the right people, and with a good balance of planning and winging it, was simply freaking amazing. Poetic, right? ;) We had really good experiences with most of our hostels, so I have no complaints there. If nothing else, they remind you to never take for granted having a place to actually call home. Walking as much as possible allowed us to actually see the city - not just wave at it through a window, or just take pictures of tourist attractions. You get the creepy streets, and you get the amazing random views - you get it all. Waking up early, and staying out every night for as long as we could, not only made us feel like we weren't wasting our money haha, but gave us the chance to see and accomplish an incredible amount. Every night I just fell into bed, so tired, but so astounded at the world and what's out there. I felt so small, but in the absolute best way possible. - On the flip side, I also think that backpacking is romanticized, perhaps too much. There is a difference between the glorification of travel, and what actually happens. The glorification is eating crepes, having full camera's, and feeling full of life. And while all those things are true, there is also the constant headache from the lack of water and proper food, ever accumulating dirty laundry you can't do anything with, and constantly feeling lost and vulnerable, like when you're stuck who knows where in France, with no idea where to catch your train that leaves in 10 minutes. It's not like every second is wondrous. Simply transporting yourself to a different country does not automatically change the way you think. Worries do not disappear, and when you're hangry (yes, hangry), and lost, looking at a map on a random street in a random city is not that fun. Maybe that's all knowledge that just comes with experience, and most of you already know all this, but it was an intriguing concept for me. - To put it all in perspective, I would without a doubt, do this whole trip over again and change nothing, but it also was shocking how relieved I was when it was over. Twas an interesting enlightenment.